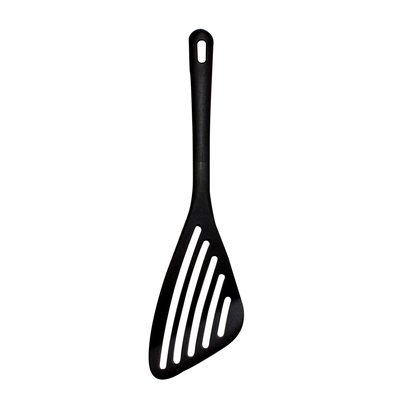 The ideal tool for serving up omelettes and eggs, our Black Nylon Slotted Spatula is a lightweight and durable option for both domestic and commercial catering environments. Designed with a small hook on the handle for on-the-wall storage, this spatula has been constructed from Nylon - a material renowned for its non-heat conducting properties. The all black finish is versatile enough for any kitchen environment while also keeping your spatula looking professional after months of use. An economical choice for all chef's, this slotted spatula also promises to leave no taste taint in your food and is both dishwasher and hand washing safe. For all your catering needs, our Catering Supplies ensure you'll find everything from Chopping Boards through to Food Labels. Our Nylon Collection also stocks all your catering equipment in this favoured, non-conductive material.